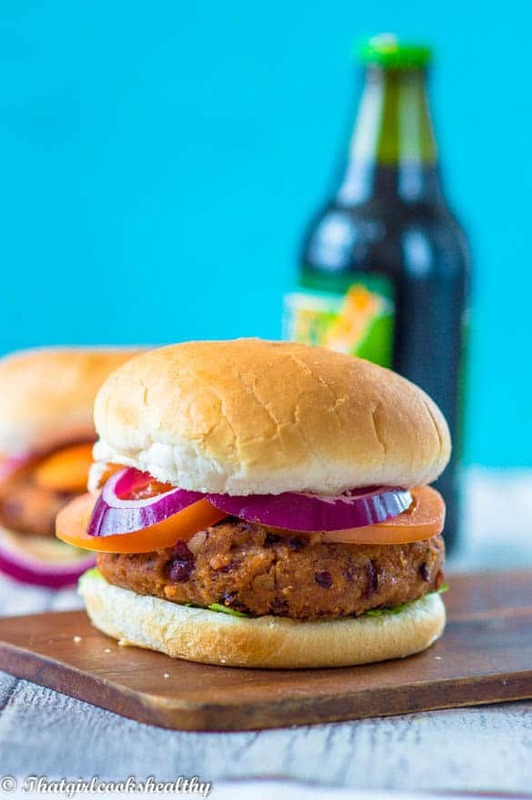 Kidney bean burger – A meatless vegetable pattie consisting of carrot, gluten free oats, legumes with an abundance of herbs and spices. 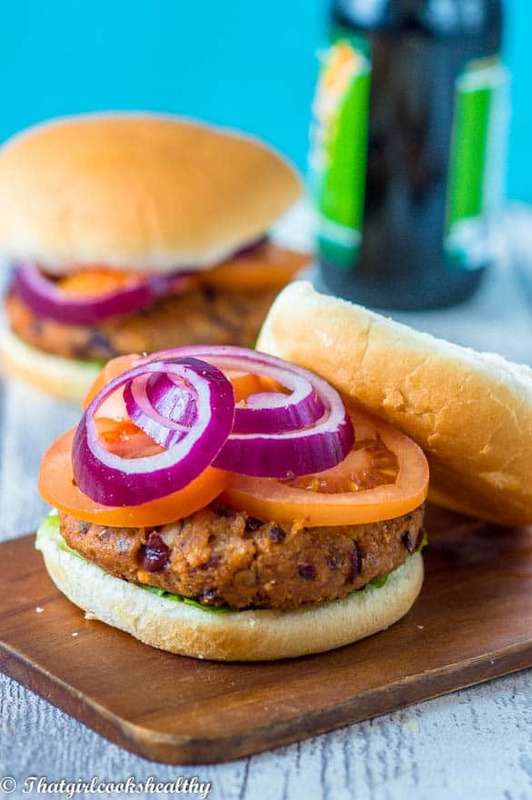 If you’re a fan of legumes then you will love this kidney bean burger. Although, I am not a vegan I would like to transition to a plant based lifestyle. Moreover, I do enjoy eating plant based foods quite often. I would say that 70% of my food habits are centred around veganism/vegetarian. There isn’t a week that goes by without Charla eating something plant based. I remember as a teenager, eating meat free food, courtesy of my mother. My mother who isn’t a vegan would cook meat free substitutes which were so foolproof. One delicacy that comes to mind was a homemade veggie burger. I think at the time she used soy, though I don’t quite recall what it was. Nevertheless, it was a household hit, one that we requested numerous times. 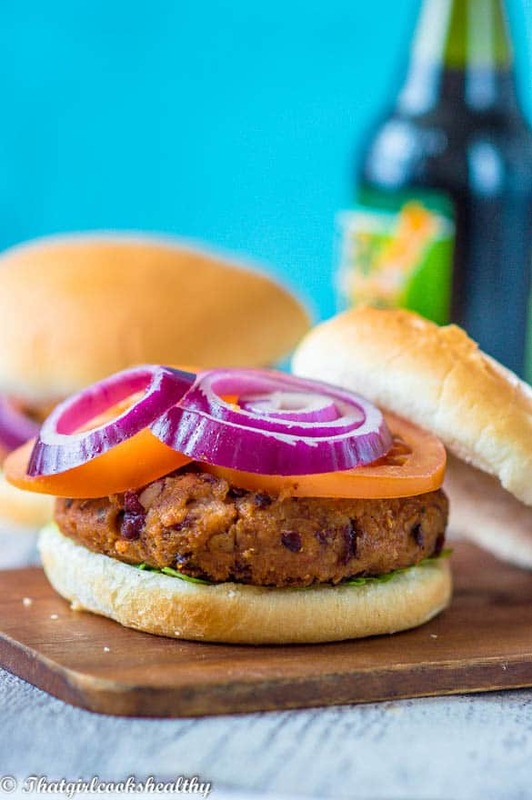 As an adult, this kidney bean burger is inspired by my fond memories. Legumes are a great source of protein and make the perfect meatless patties. The reason being is there ability to bulk up the formation of a pattie when crushed. For this recipe I choose red kidney beans for my choice of legume to use. I always have some to hand since it is used a lot in Jamaican recipes. You can buy a huge quantity of dried bean for a small price which lasts for months. I was raised using dried beans which we would tenderise in the pressure cooker to speed up the cooking process. I am completely aware that not everyone likes using dried beans but if you have a pressure cooker simply cook them in there. It should take more than 30 minutes. I believe legumes can be cooked hastily using an instant pot too. I do not own an instant pot so I’m not privy to the actual cooking method. 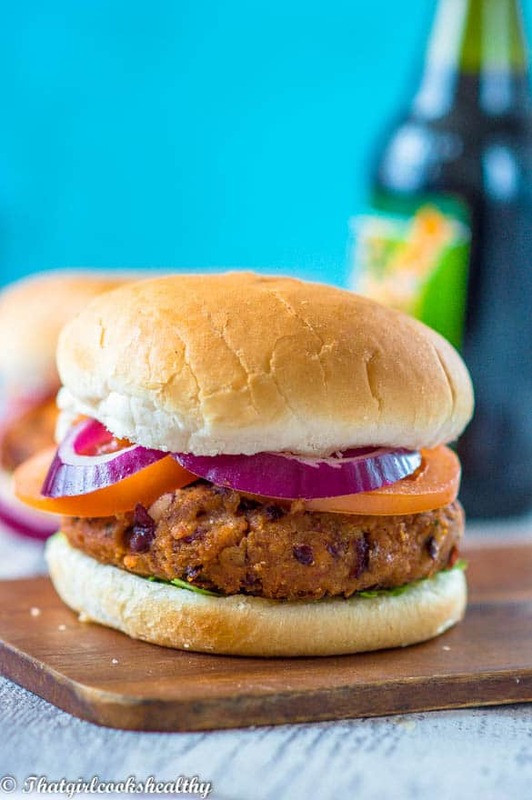 If you decided use dried beans to make the burgers, start with 1 cup which will swell and double in quantity when cooked. Alternatively, you are more than welcome to use canned beans, just make sure the water is free from salt and drain the beans of its water. You will need two cans to compensate. The beans need to be mashed and will require doing so by hand. I used my potato masher to crush the beans. It won’t take long if crushed on an even flat surface with plenty of elbow room. You cannot do this a food processor or blender or the beans will puree in its entirety. I then added the rest of the ingredients to the mashed beans starting with the carrots followed by the tomato puree, coconut aminos which is simply a soy free version of soy sauce along with the thyme (leaves picked off the stem), onion, garlic and spices. As the gluten free oats are what helps to shape and bind all of the ingredients together I mixed this is last. Use your hands to really combine all of the ingredients together before flatten into giant patties. In total you should be able to make roughly 6 if large or more if smaller. Another tip, use a good non stick frying pan to omit the use of lots of oil. I used about 4 tbsp of coconut oil (high smoke point) to cook my patties. I also made the patties flat to ensure they cooked through. If using dried kidney beans cook them in a pressure cooker for 30 minutes and drain. Skip the above step if you have chosen to use precooked drained beans. Lay the beans out on a flat even clean surface and mash them down. Once done, scoop them up and place in a large bowl. Add the grated carrots to the bean bowl followed by the cool onion/garlic mixture, tomato puree, coconut aminos, pink salt, ground coriander, cumin and chilli. Carefully pick the small thyme leaves from their stem and sprinkle into the bowl. Shape the bean mixture into large flat patties. Melt some coconut oil (approx 4 tbsp) in a non stick (very important) frying pan on medium heat. Cook the patties until golden on each side (should take 2-3 minutes per side). Yes yes we like legumes and meat alternatives 🙂 I have a jar of kidney beans in the pantry so definitely trying this! I’m a big fan of legumes. I eat a plant-based diet, with meat occasionally, but homemade vegetarian burgers I love so much!! Definitely Silvia. They are the way forward! I know what I am making on Meatless Monday! Thanks Traci. It’s definitely filling, I can tell you that much and tasty too! 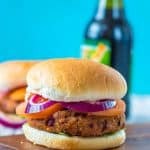 I love veggie burgers and am always trying new recipes. This one looks amazing! Apologies Josal. It should be 1 1/2 cups of oats and chilli powder is what I used. I have updated the recipe to reflect this. Where do you get coconut aminos?? I’ve only tasted them once at an expo. Local health stores are now stocking it but this does depend on your geographical location so the easiest place to purchase it from would be Amazon.